Kid Koala took the critics by storm with his exploration of using the turntable as an instrument like no other on his proper debut "Carpal Tunnel Syndrome". Since then, he's toured with the likes of Ben Harper, the Beastie Boys, Radiohead, and Bullfrog (as well as headlining his own shows). In addition, he's also worked with Dan the Automator and Deltron 3030 (aka Del Tha Funkee Homosapien) and Gorillaz. Not to mention he also released a 300-page comic book. For the most part, Koala dives into the leanings of his debut. 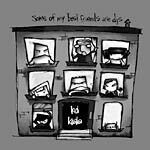 In some ways, "Some of My Best Friends Are DJs" is better than his debut. He's found ways to expand his style and experiment in ways that even the converted will be shocked by. The soaring scratch melody of "Basin Street Blues", the exuberance of "Stompin' at le Savoi" and the enthralling "Skanky Panky" are arguably better than anything off of "Carpal Tunnel Syndrome". With that said, there is a bit less rhythm and unity here. A slight complaint would be that the music stops too much, and doesn't flow quite as well. But like his debut, repeat listening overshadows these weak moments with all of it's positive aspects. Overall, if you were a fan of the first record, this should definitely please you.